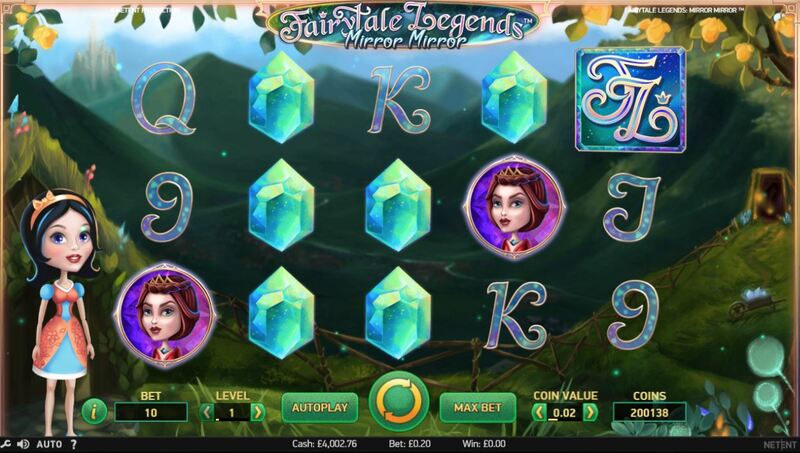 Mirror Mirror slot is the latest addition to Netent's 'Fairytale Legends' series of games and joins Red Riding Hood along with Hansel and Gretel and Snow White with pretty much the same format and appearance but at least one major difference as we'll discover. The cartoon background and transparent reels are similar as are most of the symbols aside from the main characters and we get the fairy tinkling as we play too in order to maintain the style of the series. The previous games have been entertaining despite the childish appearance, so how beneficially can Mirror Mirror reflect on our bankroll? Unlike the other slots in the series, here we get 243 ways to win over the 5 reels of 3 rows each. 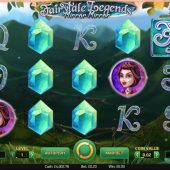 The pays are naturally lower but we retain the stacked FL (Fairytale Legends) symbol as the highest pay and in this case a full screen of them would award 7.5x our 243 ways, or a very welcome 1822x our 20-coin stake! The evil Queen and presumably Snow White are 75 coins for 5-of-a-kind and there are two crystals paying 50 coins each and then six card values offering either 25 or 15 coins for a full way. There are no Wilds here but we get the same old 3 Gold Chest scatters on reels 1,3 and 5 along with a liberal sprinkling of the Fairy's random features. There is a Mirror re-spin feature which can appear via a randomly placed Mirror on reel 3. There will then be either a Princess or Evil Queen selected and the reels will re-spin, holding any of the same which appear until no more winning combinations can be added. This can also be one of the Fairy's random features. The other two are Fairy Magic re-spin in which a block of 5 to 7 medium-value icons is overlaid on the reels and may or may not create a win and finally Fairy Surprise. After a losing game, a medium icon is selected and all the other icons lower are removed in order i.e. 9,10,J etc. and replaced with the chosen one until a win is created. The three Gold Chests land on reels 1,3 and 5 to trigger this but if there are only two on reels 1 and 3 then the one on reel 5 may randomly appear in a sprinkle of Fairy Dust but only if the spin was a losing one. You will be awarded either a Mining Bonus, Free Spins or yes! the accursed 'Coin Win' which unfortunately developers still think we like after waiting an age for the feature to trigger. So the Mining Bonus is simply a chance to break up to 9 crystals containing 50 to 500 coins each and therefore the free games are what we really want. You get 10 spins with a Mirror added to reels 1 and 2 to greatly increase the chances of the Mirror re-spin feature but you cannot retrigger the bonus. You do however seem to see the Fairy appear more often with her random dusting of benevolence!